Traditionally, while marketers might have talked about empathizing with customers, it was a stretch for brands to display humanity. Then, people became less responsive to un-human brands. No group better encapsulates the appeal of flawed, human heroes than the characters of “Friday Night Lights.” On the current season, we’ve seen two brands embrace vulnerability: Sears and Under Armour. Traditionally, while we in the marketing world might have talked about the importance of empathizing with customers or responding to complaints, it was an unfathomable stretch to imagine the brand displaying humanity. After all, humanity is a sign of weakness, of imperfection, of subjectivity. In short, the human condition is fraught with frailty, and frailty is surely the biggest enemy of the brand. In fact, brands were not to be equated at all with mere mortals; they are the signposts of our culture that were here before we arrived and that will be here long after we’re gone. Then, something happened in our culture. Suddenly, people became a little less responsive to the un-human brand. People started questioning how this brand seemed to exist as something different than the people who represent it. And we collectively became a bit more distrustful of the pristine hero. Thus, the infallible wisdom of Microsoft gives way to “I am PC.” Superman feels a little less a statement of our times than Tony Stark’s Iron Man. Hulk Hogan gives way to John Cena. This is not to say that there aren’t continuing trends of the implausibly omnipotent savior in our culture (Jack Bauer, anyone? ), but there has been a definite shift toward a hero that admits weakness, that doesn’t always have the upper hand, that makes mistakes and shows its humanity. Perhaps no group of people best encapsulate these flawed, human heroes than the Panthers and now Lions of a fictional little town in Texas called Dillon. 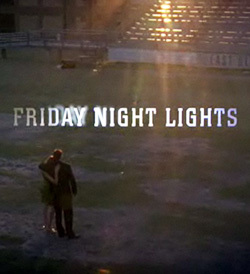 The characters who comprise NBC’s Friday Night Lights have wowed a niche audience for five seasons now by presenting a group of teenage town heroes and the adults who support them not as feisty, fighting underdogs (which they are, of course) , but also as imperfect humans who sometimes make blunders, but blunders we often mitigate. Paul Levitz, publisher of DC Comics, writes about this as the distinction between sincere and insincere mistakes, sincere mistakes made by humans trying to do their best, insincere mistakes as the result of those openly ignoring their audiences or problems with their brand. What’s so compelling about the characters of Friday Night Lights is how deeply we want to root for almost all of them, even when they may find themselves at odds with one another, and how their characters are strengthened by their flaws. But, while I think marketers can learn from some of the open vulnerability of these young football titans, I think we can all be especially enlightened by the vulnerability and humanity displayed by the brands who have gotten into the mud with FNL‘s actors. In the first two seasons, Applebee’s was a significant presence on the show, as the chain restaurant that almost seemed too big for Dillon and thus a meeting point for local car dealer and football booster kingpin Buddy Garrity to hold meetings. The show–and Applebee’s–had a sense of humor about the “neighborhood” joint being the chain, and–as some of the teenage characters waited tables at Applebee’s–they did little to glamorize life as a chain restaurant server. The brand didn’t insist on a sanitized version of Applebee’s, and–as a result–it delivered an experience that felt natural…human even. 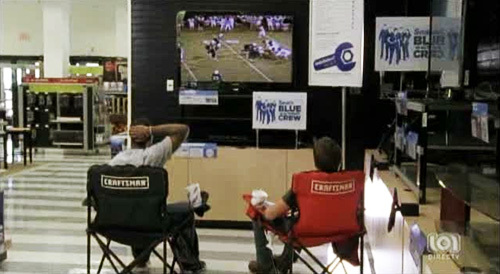 On the season of FNL currently airing on NBC, we’ve seen two other brands embrace this vulnerability. Sears has been a major sponsor of the season, being integrated into the storyline by having a new assistant coach character being a Sears employee. There is some comedy involved with certain scenes taking place at the department store, and one of the down-on-his-luck characters is shown dressing up and trying to get a job at Sears, only to be let down gently. Again, Sears is not glamorized, and it’s employees are not shown to be perfect. However, it’s inclusion in the show and its honesty about who it is builds a great deal of credibility with FNL viewers, in my estimation. Perhaps most interesting this season was the positioning of Under Armour, a supporter throughout the series. When show patriarch Eric Taylor can’t afford new outfits for his players, he has a frank conversation with the Under Armour representative he deals with. They acknowledge that he’s been a longtime loyal customer of theirs but likewise tell him that they can only cut him so much of a deal, leading to Coach Taylor taking the risky move of paying for the uniforms out of his own pocket–without telling his wife. Here, a brand willingly allows itself to be, in a way, the catalyst for strife for our protagonist, Under Armour is shown as a company with compassion, but nonetheless a company, one that can’t realistically offer its wares for free to every sports team with limited budgets. It gives me great hope as I see brands willing to show a few cracks in their armor. Maybe they are bringing the brands off the pedestal a bit, down into the culture that gives it life. Maybe they are following the lead of brands like Southwest Airlines, who have used social media as a way to demonstrate the people who work at the company; or Comcast, that has used social media to help begin to own up to a universally despised system of customer service. But I hope that brands of all shapes and sizes look at the bold game plan of these brands by showing some vulnerability on the field in Dillon, Texas. I think there are a few lessons learned for all of us about the danger of the hubris of marketers, and about the need for brands that aren’t afraid to show a few signs of weakness. Sam Ford is a research affiliate with MIT’s Convergence Culture Consortium and Director of Digital Strategy for Peppercom, a PR agency. Ford was previously the Consortium’s project manager and part of the team who launched the project in 2005. Ford has also worked as a professional journalist, winning a Kentucky Press Association award for his work with The Greenville Leader-News and publishing a weekly column entitled “From Beaver Dam to Brooklyn” in The Ohio County Times-News. He also blogs for Peppercom’s PepperDigital. Follow him on Twitter @Sam_Ford.